McIntosh C2500 review | What Hi-Fi? We love the way the C2500 looks and its comprehensive feature list. It has an engaging way with music replay too. McIntosh’s C2500 must be the most versatile high-end preamp we’ve ever tested. Look beyond the distinctively gothic appearance and you’ll find a forward-looking, comprehensively equipped product that can easily form the heart of any top-end stereo set-up. The visuals are all McIntosh. The brand has such a strong identity that this preamp really couldn’t be from anywhere else. The traditional output meters used in the C2500 are lit in the company’s trademark blue. We’re not sure how useful they are; we just know we like them. A lot. Apart from the gauges, there’s the black glass front panel and the distinctively traditional control design shared with other products in the range. Only the large central display suggests there’s something modern going on here. The big news here as far as features are concerned is the integrated digital-to-analogue conversion circuitry, with inputs for USB, coaxial and optical connectors. But the headlong rush to accommodate most things digital hasn’t seen traditional sources being ignored, either. Unlike most rivals – which are usually line-level-only units – the C2500 has a built-in phono circuitry that will handle both moving-magnet and moving-coil cartridges. Take a look round the back and you’ll find a plentiful supply of line-level connections of both the single-ended and balanced XLR variety. This preamp has three XLR outputs, two of which are switchable – handy for use with secondary power amplifiers in other rooms. And let’s not forget about the headphone output. Most high-end rivals are more than happy to get rid of their headphone capability on the grounds of improved sound quality (and cost, no doubt). But, McIntosh has taken things seriously and delivered a good quality design that mirrors the performance of the main outputs, which is not always the case. The preamp’s build quality is good, as is its finish. It feels solid and functional rather than luxurious, and its controls work with precision. We’d like just a touch more weight and resistance to the volume knob and input selector though, just to reinforce the quality message. For the most part this preamp feels like a focussed tool to do a specific job as opposed to being something to show off with, and we’re fine with that. However, it wouldn’t be a true McIntosh product if there weren’t some form of visual excitement. Alongside those lovely meters you also have the option of having the valve compartment lit. The three pairs of small valves – the heart of the C2500’s electronic circuit – are clearly visible through a window at the top, and the extra light just makes them look a little more special. The effect is understated enough to leave on all the time. The company has also printed a full set of technical specifications on the top panel. Useful? Possibly, but regardless, the inner nerd in us quite likes it. You never know just when you might need to know the frequency response or the rated harmonic distortion in a hurry. The C2500 is a big unit. Make sure you have a big enough support for it – something that also leaves a good amount of space for air to flow, so preventing the preamp from getting too hot. Once that’s sorted, set-up is relatively straightforward. Delve into the unit’s menus and the inputs can be renamed, while the sensitivity and tonal balance for each can be tweaked to taste. We’re big fans of the McIntosh sound. It’s huge, spreading the sound stage well beyond the outer edges of our reference ATC SCM 50 speakers. Partnered with Bryston’s 4B SST2 power amplifier the stereo imaging is pleasingly precise. Each sound is crisply focussed, and stays stable even when things get busy. Listening to Mahler’s Symphony No.4 in 24-bit/192kHz (through USB) is a real treat. The preamp has a large scale, authoritative presentation that also demonstrates lovely delicacy when required. 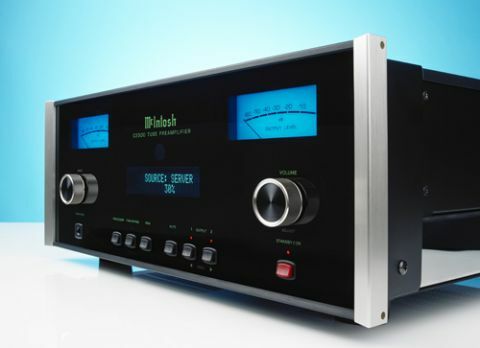 The McIntosh’s overall tone is on the rich side of neutral, but never seems overly rounded at higher frequencies. There’s plenty of bite in the treble but a pleasing refinement too, which stops the preamp getting unnecessarily hard-edged even when the recording is. Playing alt-J’s Dissolve Me (from our Naim NDS/555ps streamer through the analogue inputs) shows off the McIntosh’s lovely, full-bodied midrange, and its ability to keep the music’s rhythmic elements in place. While it doesn’t convey the full force of momentum in the track, the C2500 still manages to charge along with enthusiasm. Low notes have real power, and are tracked with a decent degree of precision. Move to vinyl and the good news continues. We plug our reference Clearaudio Innovation Wood package into the C2500’s moving coil input and are treated to plenty of detail and a refreshingly low noise floor. A play of Dave Brubeck’s Take Five shows off the McIntosh at its best. Here, the preamp delivers a sound with lots of space, with real sparkle to the cymbals and plenty of punch to the drums. The rhythmic elements are nicely delivered but most of all the slightly rich tonality gives the sound a really appealing solidity. There’s a pleasant warmth to the presentation and an easy-going attitude that makes the C2500 a very tempting long-term proposition. If you’re looking for absolute transparency we don’t think this McIntosh is for you. Its smooth, full-bodied character is a little too strong to deliver that. But if you want an easy-going, comprehensively equipped preamp that treats analogue and digital sources with equal respect, give this one a listen. It deserves serious consideration.